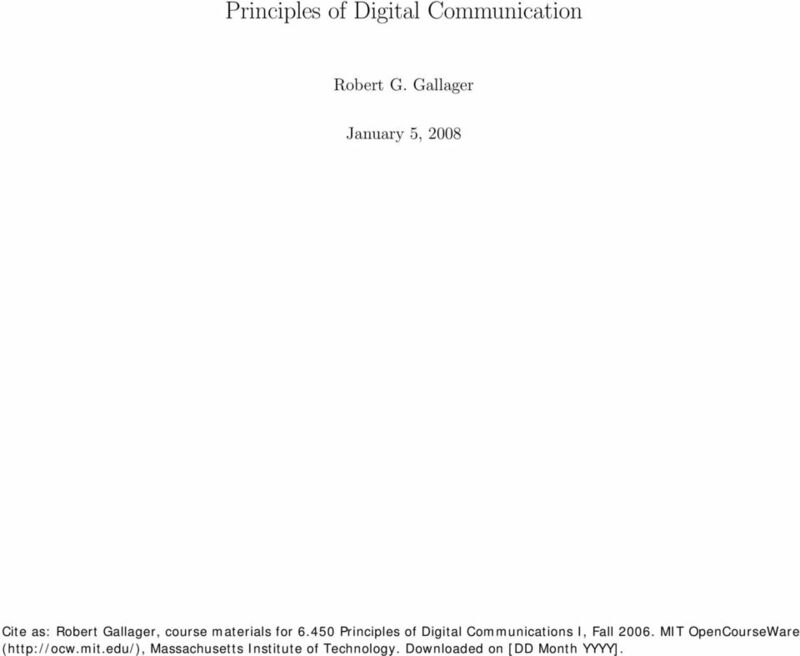 Download "Principles of Digital Communication"
3 iii to find the general properties of those models. To oversimplify it, engineering determines what the reality is and theory determines the consequences and structure of that reality. At a deeper level, however, the engineering perception of reality heavily depends on the perceived structure (all of us carry oversimplified models around in our heads). Similarly, the structures created by theory depend on engineering common sense to focus on important issues. Engineering sometimes becomes overly concerned with detail, and theory overly concerned with mathematical niceties, but we shall try to avoid both these excesses here. Each topic in the text is introduced with highly oversimplified toy models. The results about these toy models are then related to actual communication systems and this is used to generalize the models. We then iterate back and forth between analysis of models and creation of models. 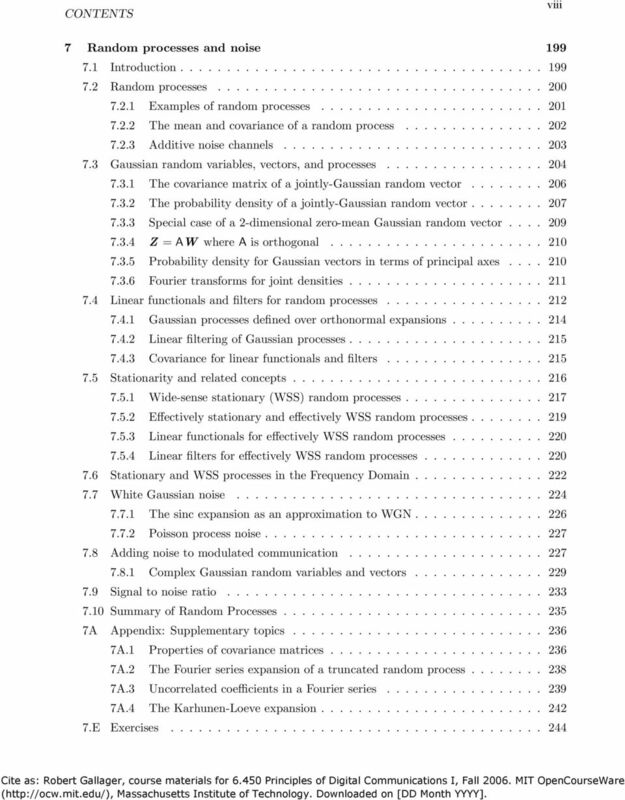 Understanding the performance limits on classes of models is essential in this process. There are many exercises designed to help understand each topic. 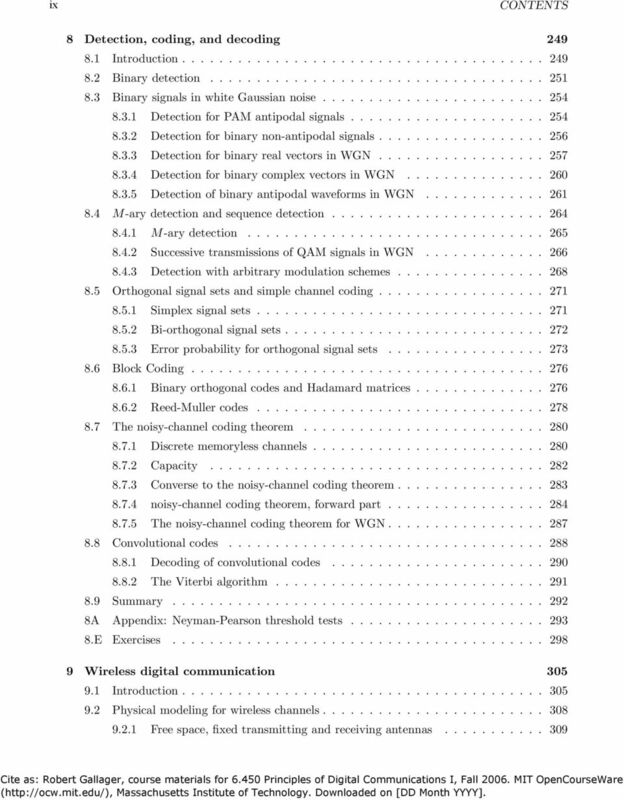 Some give examples showing how an analysis breaks down if the restrictions are violated. Since analysis always treats models rather than reality, these examples build insight into how the results about models apply to real systems. 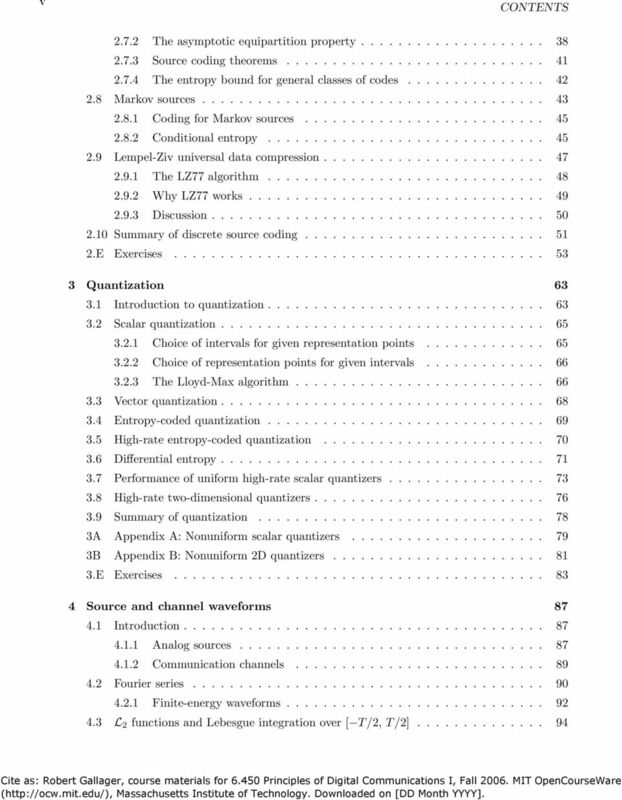 Other exercises apply the text results to very simple cases and others generalize the results to more complex systems. Yet others explore the sense in which theoretical models apply to particular practical problems. It is important to understand that the purpose of the exercises is not so much to get the answer as to acquire understanding. Thus students using this text will learn much more if they discuss the exercises with others and think about what they have learned after completing the exercise. 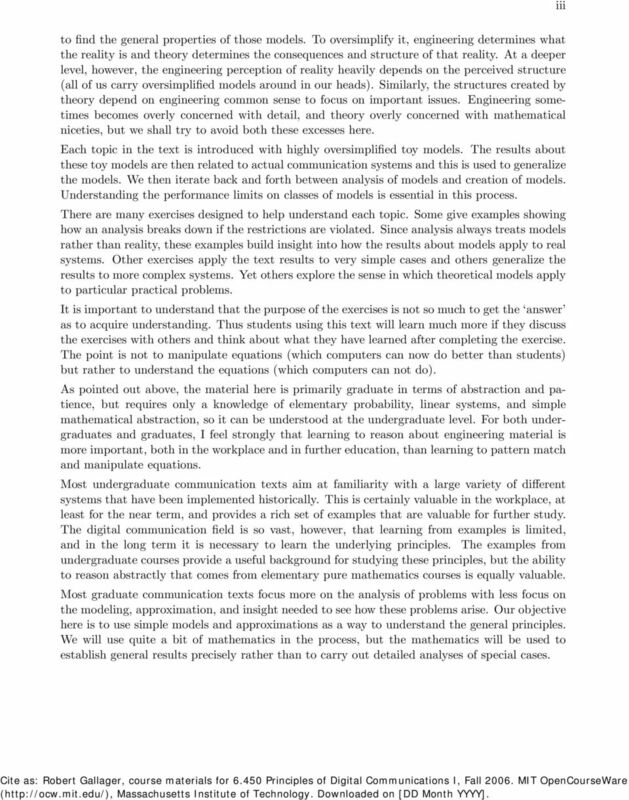 The point is not to manipulate equations (which computers can now do better than students) but rather to understand the equations (which computers can not do). As pointed out above, the material here is primarily graduate in terms of abstraction and patience, but requires only a knowledge of elementary probability, linear systems, and simple mathematical abstraction, so it can be understood at the undergraduate level. For both undergraduates and graduates, I feel strongly that learning to reason about engineering material is more important, both in the workplace and in further education, than learning to pattern match and manipulate equations. Most undergraduate communication texts aim at familiarity with a large variety of different systems that have been implemented historically. This is certainly valuable in the workplace, at least for the near term, and provides a rich set of examples that are valuable for further study. The digital communication field is so vast, however, that learning from examples is limited, and in the long term it is necessary to learn the underlying principles. 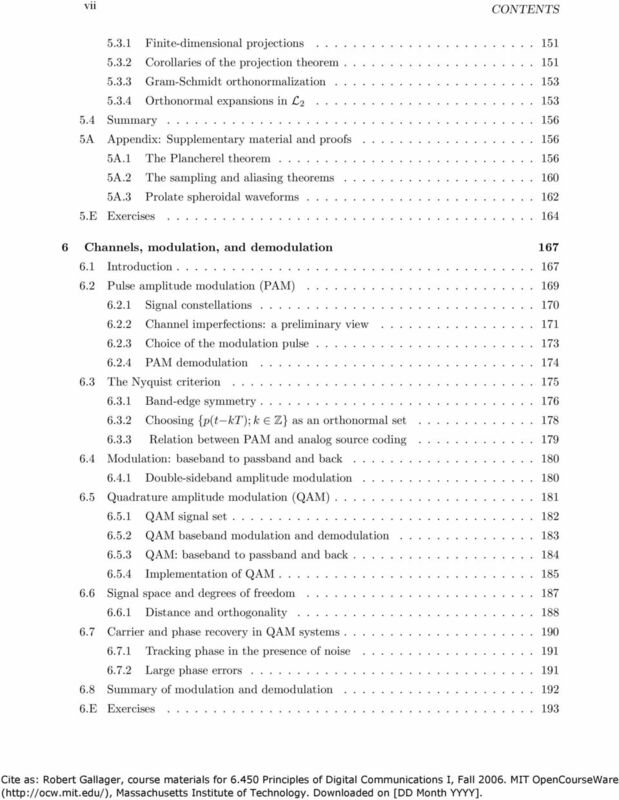 The examples from undergraduate courses provide a useful background for studying these principles, but the ability to reason abstractly that comes from elementary pure mathematics courses is equally valuable. 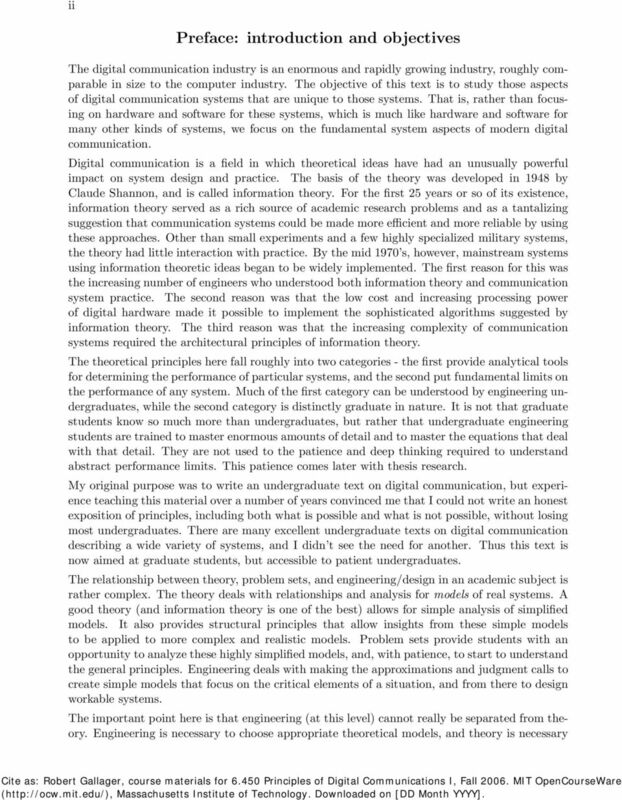 Most graduate communication texts focus more on the analysis of problems with less focus on the modeling, approximation, and insight needed to see how these problems arise. Our objective here is to use simple models and approximations as a way to understand the general principles. We will use quite a bit of mathematics in the process, but the mathematics will be used to establish general results precisely rather than to carry out detailed analyses of special cases. 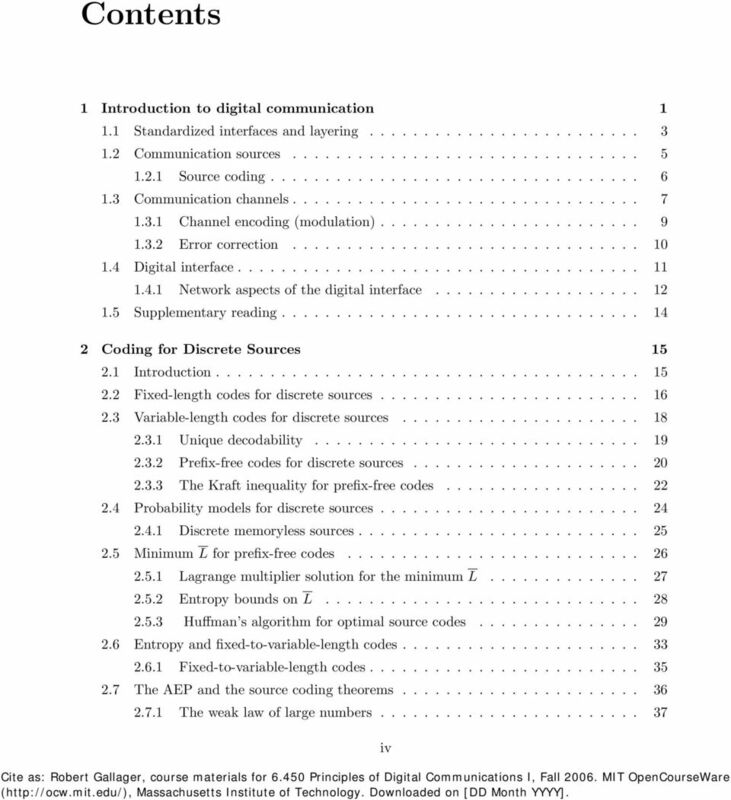 Digital Communications Fourth Edition JOHN G. PROAKIS Department of Electrical and Computer Engineering Northeastern University Boston Burr Ridge, IL Dubuque, IA Madison, Wl New York San Francisco St.
ADVANCED LINEAR ALGEBRA FOR ENGINEERS WITH MATLAB. Sohail A. Dianat. 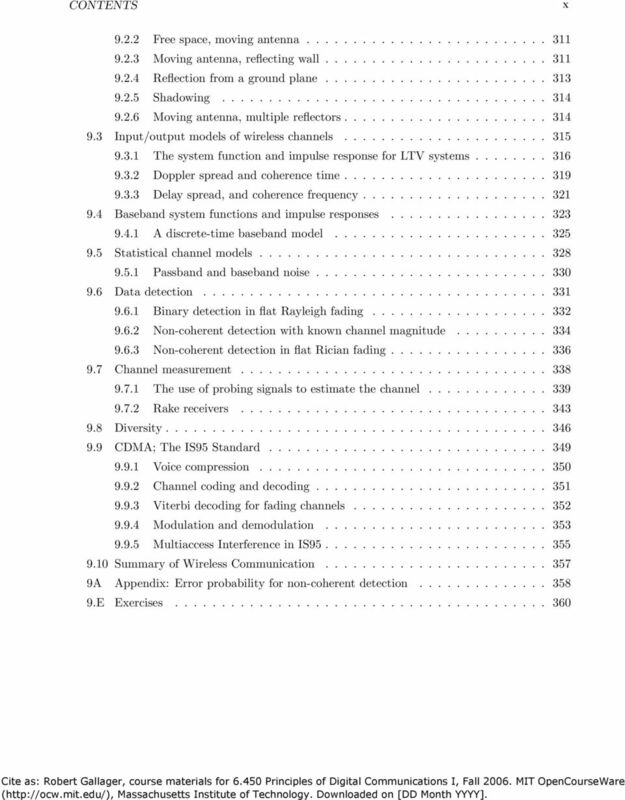 Rochester Institute of Technology, New York, U.S.A. Eli S.
CHAPTER The wireless channel A good understanding of the wireless channel, its key physical parameters and the modeling issues, lays the foundation for the rest of the book. This is the goal of this chapter. R U S S E L L L. H E R M A N A N I N T R O D U C T I O N T O F O U R I E R A N D C O M P L E X A N A LY S I S W I T H A P P L I C AT I O N S T O T H E S P E C T R A L A N A LY S I S O F S I G N A L S R.
1 An introduction to generalized vector spaces and Fourier analysis. 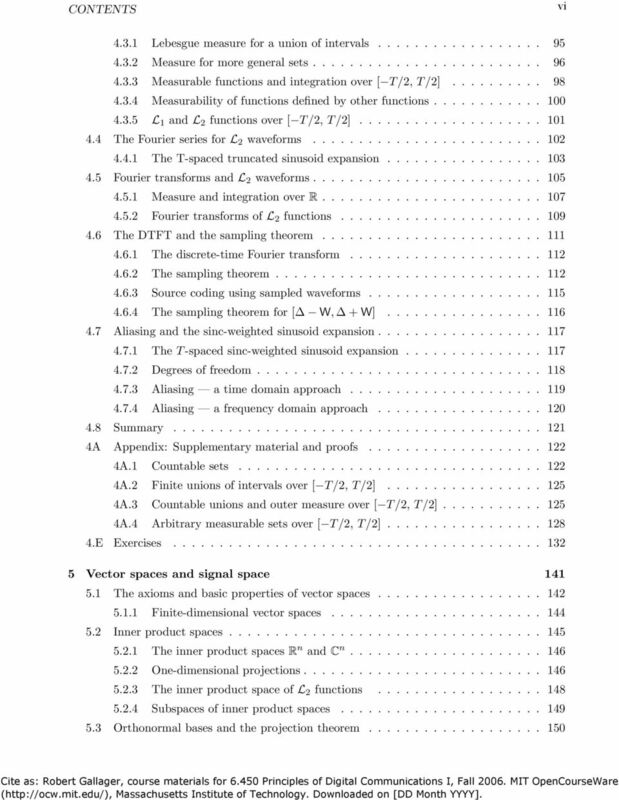 by M. Croft FOURIER ANALYSIS : Introduction Reading: Brophy p. 58-63 This lab is u lab on Fourier analysis and consists of VI parts.